Yes! It’s time to look at some more cool, new, shiny Firefox extensions. easyComment: If you are into blogging, this experimental add-on is a must have. It automatically fills out blog comment forms. It also supports multiple commenting profiles and even language mutation. I used to use InformEnter but I am trying this now. FireScope: This is a tool by the site popular with web developers. Firescope is an add-on that integrates with Firebug and extends it with reference material for HTML & CSS. I learnt most of my HTML and CSS though Firebug and this is going to take it up a notch. DragDropUpload: Drop files directly onto attachment boxes instead of browsing for them. If you attach a lot of files in Gmail, this could be a God send! You can drop multiple files and it auto-fills all entries too. Flickr Gallery Plus: Flickr is one of my favorite websites and I power it with the Better Flickr add-on, which is a collection of Flickr Greasemonkey scripts. Flickr Gallery Plus also adds features like set/gallery view – 1 large pic with thumbnails of others, keyboard navigation, slideshow of all pics in a set, etc. SEO Toolbar: This is a brand new SEO add-on by the popular Aaron Wall. Give it a try you might just fall in love. SearchStatus is another one of my favorite Firefox SEO add-ons. FoxLingo: Google Toolbar usually meets my translation needs but if you are looking for an ultimate language tool, you need FoxLingo. It can do web page translation, translated search, auto translation, text translation, language resources & learning languages, etc. Enjoy the new extensions. Make sure you remove the ones you hardly use to keep your Firefox from getting bloated and slow. 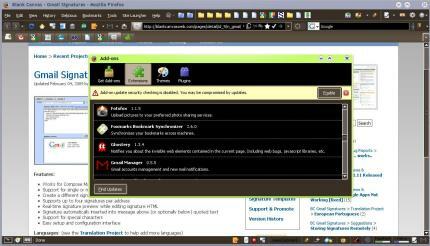 Right balance of extensions will give you the pwer and freedom of Firefox plus the speed. If you are a fan of dark colored themes, PitchDark for Fx is a clean minimalistic dark theme. I like it as much as my last week’s Firefox theme and I might keep this for a while. The different brownish dark color is a welcome change than the usual black. Totally cool list – I have already used the Firefox nofollow flag addon, so I am defo gonna have a look at these new SEO stuffs..
Easycomment is a great plugin, i will try it now. but for seo toolbars, i prefer the seoquake toolbar. diegos last blog post..bluetooth for the iphone. I was wondering – what do you think of 1waylink.net? Or is linkvana better? I am trying to find the best system possible. My Firefox addons are always rotating. I thought I had a set of them that would last a few months and then you had to mention FireScope. Firebug is a life saver and I can’t wait to see what this addon will do. Also I use Autofill form for blog comments and since it is a universal form filler, you can use it for things like signing into user profiles at social networks and other places. I love the SEO Book toolbar extension. It’s really great and one of the few toolbars I’d actually install. I’m also going to have to try easyComment. Thanks for the suggestion! I’ve just had to uninstall the SEO extension – I had real issues with my Firefox being very sluggish, I uninstalled just about every extension, but it ended up being the SEO one, shame as it was useful, but the slowness it appears to cause on my system was just too frustrating to keep it. Really it is nice and thanks for sharing it. easyComment is one amazing extension. It helps in speeding up the commenting process. Never tries SEO toolbar but SEO FF extension also serves up the purpose. Nice tech blog! Wow, just tried out the Easy Comment and it’s great, what a time saver and works perfectly! THANK YOU K!! This is a wonderful plugin. Thanks for sharing. unoblogger@make money bloggings last blog post..What are Keywords? Through Gmail we can attach the files more easily and fastly. We need not spend much time in attaching the reports or anything else. Thanks. Well its time to test the Firefox for me. I am using Chrome, quite satisfied. It could be better, like with all things. But this post forced me to finally test the Firefox.. Thanks, and I hope I will satisfied with result. Easy comment is a great tool. Highly recommended for everyone who comments at least once a week. Moztrans is another option for translation of Mozilla Firefox and also thunderbird and seamonkey. http://home.interlecta.com/desktop Thanks for the tips!